*Editor’s Note 1/2/17: I’m sad to report that this eatery is no longer open. If the divey dinner aesthetic of Han’s represents the “Tenderloin” part of the Tendernob neighborhood, then Sweet Woodruff would represent the “Nob Hill” portion. 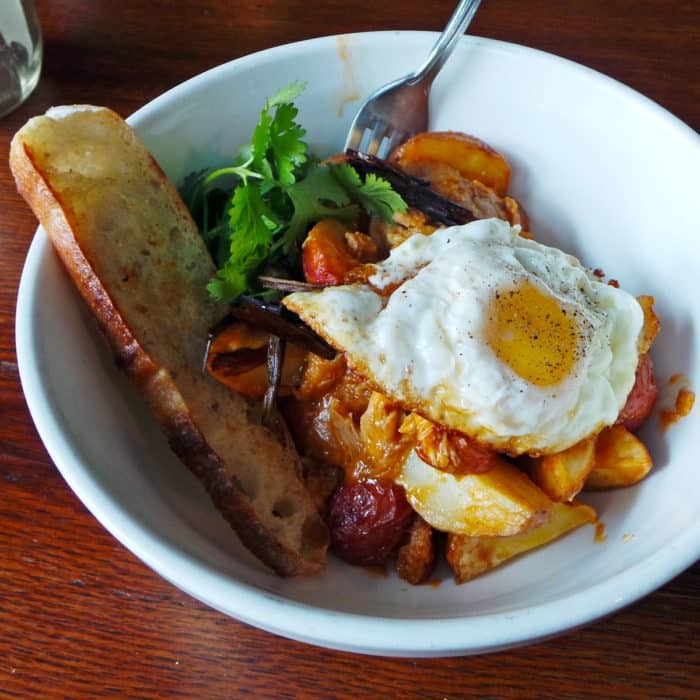 Only one block away from Han’s but a world of difference away in vibe you’ll find a completely opposite brunching experience with a much more trendy and modern take on the meal. 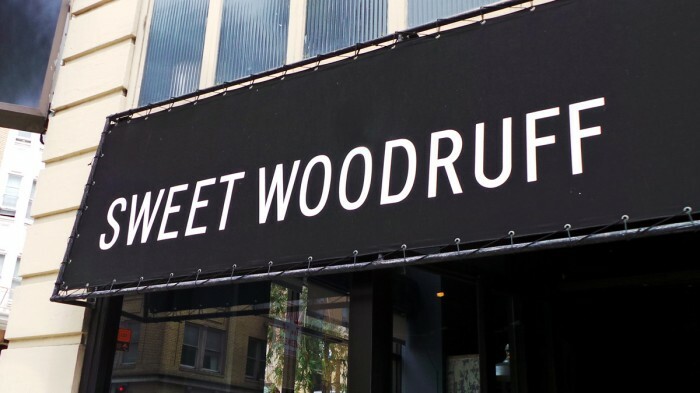 Though it’s a fast-casual cafe without waiter service, a meal at Sweet Woodruff feels quite a lot more buttoned up than a meal at Han’s. In fact, the place runs more like a test kitchen than a restaurant, but you can have the pleasure of eating these daily changing experiments. Two-thirds of the large room is taken up by a wide-open kitchen so you get a bit of a show watching the staff hustle around while you eat. It’s a really bustling place with high-energy workers and bumpin’ beats to get you on their level. 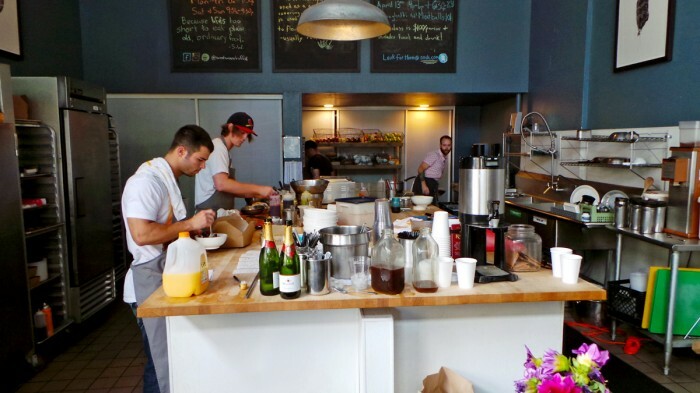 Just step up to the counter, make your selection from the ever-changing menu and watch as the mustachioed hipster chefs hurriedly shuffle though the kitchen to whip you up delicious culinary concoctions. Since the menu changes so frequently, there’s no guarantee that the brunch dishes I had will be available during your visit. But if they are offering grits, get ’em. 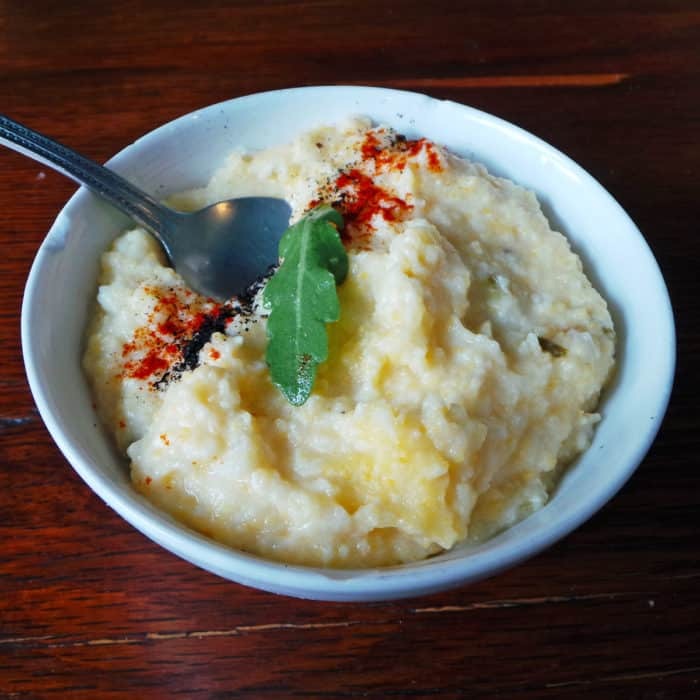 These were some of the most flavorful, bold, savory grits I’ve ever had. They were thick, creamy, slightly grainy, spicy, and supremely cheesy. That in-your-face parmesan flavor resonated with every incredible bite and the spice sprinkling of ground serrano pepper and smoked paprika was awesome. Having a bowl of this Southern classic is highly recommended, but even though it was delicious and filling, that was only my brunch starter. For my main course, I went with a dish simply named Skillet. To be a little more descriptive, it was a skillet-cooked bowl of potato wedges, chicken, crispy fried egg, charred scallion, cilantro, and smoked peach-apricot reduction. Holy cow, what a killer brunch dish! I have no idea how they made that sauce so additively delicious, but it was absurdly good. Perhaps they ran around the corner in The Tenderloin for the most addictive secret ingredient there is — crack. I’m just kidding (probably), but it was ridiculously good. That huge bowl was loaded with enormous hunks of tender, juicy, pull-apart, dark-meat chicken and crispy griddled potato wedges — a combination that just screamed Southern brunch. This dish was also truly awesome. 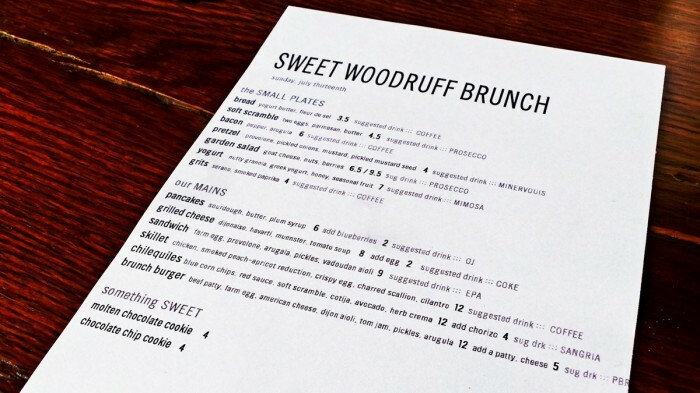 So if you’re looking for an amazing brunch in the Tendernob area and want something a little more upscale and polished feeling than a divey Korean diner like Han’s, Sweet Woodruff’s has got you covered. I’ve only sampled two of their offering so far, but I know I’ll be back to eat my way through the rest of their undoubtably amazing lunch and dinner creations. 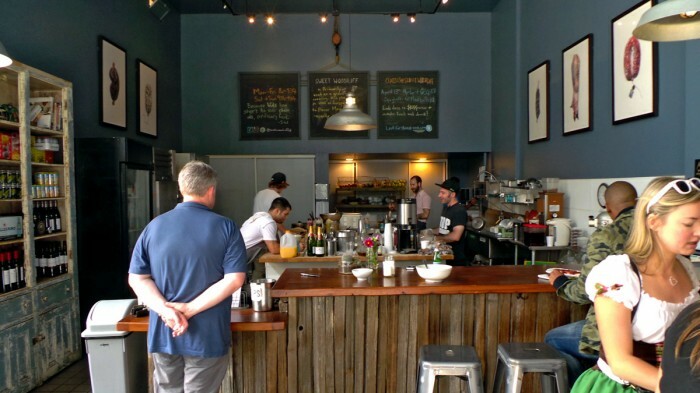 Got another outstanding brunch spot in SF I need to check out? Let me know in the comments below.